Growing cranberries is a unique and unusual hobby. These small, red berries are deeply interwoven into the culinary roots of the United States, and it is truly a Native American plant, growing only on the North American continent. It can be found from eastern Canada, down the East Coast of the United States to North Carolina and west to Minnesota. The plants can often be found growing wild in the bogs and swampy areas of these regions. Runners, which trail and spread the plant as much as two feet in one growing season. Uprights grow up from the runners and produce the flowers and fruit. The plant's fine root system only grows in the top four to six inches of soil. Cranberries require a moderate climate that doesn't get too hot in summer, or too cold in winter. These evergreen plants do best in zones two through five, although they can be cultivated in other areas with extra care.Most home gardeners will plant only a few cranberries as an interesting addition to their garden. In this case, the cranberries can be planted in an acidic soil with good drainage. The pH should be between 4.5 and 5.0. If you are planning a large field of cranberry plantings, it will need to be flat and it must be close enough to water that it can be flooded with a dam or floodgate. Cranberries should be planted in the fall up through early November, or they may be planted in the spring from April 15th to May 31st. One half part bone meal. For a clay or silt soil do not add the liner to the hole, just directly add the peat moss. Space one year old plants about one foot apart, placing the root ball two inches below the surface of the ground. Water the plants frequently to maintain a water supply to the root systems. Plants should not be soaked, but the peat moss should stay moist to the touch. A rainwater irrigation system is great for this purpose. Growing cranberries in containers is also possible. The plants will need to be replaced after every three years of producing fruit. They can also be grown in hanging baskets. A fish emulsion fertilizer should be applied at a rate of one-half gallon per month. Prune the three-year-old runners and uprights. One-year cuttings will take two to three years to produce fruit. Add a layer of sand to the bed every two to three years. Harvest can be expected to be about one pound of fruit for every square foot of bed. Fruit should be harvested before frost, and can be expected to ripen in October, depending on your growing area. Softwood cuttings root readily in mid -summer for propagation. Cranberries are a great groundcover, or as an informal hedge, depending on type. The University of Maine has a fabulous website about cranberries with curriculum helps and printables for teachers, as well as numerous cranberry facts and information for classroom use with children of all ages. Growing cranberries in the home garden is a great way to integrate gardening with a study of American History. 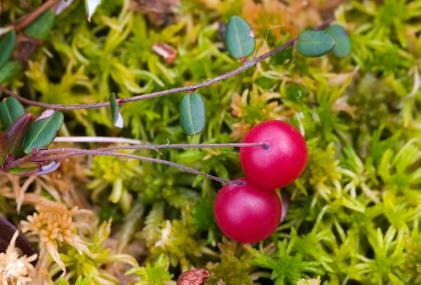 With patience and care, cranberries can have a place in almost any North American garden.